The other week my best friend prosposed we catch up for dinner with our respective fellows. Initially this was a belated birthday celebration for my recent 29th birthday, but as it turned out it also gave us a chance to raise a glass to my engagement to GG, which had happened in Bali only a few days prior. Happiest gal ever! So we decided we’d give P’tite Ardoise Bistro in Highgate a go. I’d wanted to try it for a while, it was getting quite the rave reviews by fellow foodies. It was found across the road from the Brisbane, where the Beaufort St Steakhouse had lived for a spell. The restaurant itself is quite small and definitely cosy with the vicinity of some of the tables to one another. There are basically two rooms and we were in the smaller of the two. It was raining (in late Spring I know its almost unheard of!) but yes raining in November and the feel of P’tite A’droise was very warm and inviting. As were the staff – very friendly and ensuring that we had plenty of their fresh bread rolls to nibble on (with accompanying butter, olive oil and olive tapenade) and glasses of water to keep us well hydrated. Now one of the key bonuses about this place is that it is currently BYO. Being able to being your own nice bottle of wine from home is always a treat. Now GG and I were particularly spoiled on this outting as our fellow dinner guests – M&M – had brought along the wine, a very choice bottle of red and white and then also a bottle of Veuve to cheers in the engagement. What a lovely pair they are. Now none of us had been to this place before so we were keenly perusing the menus for what we would have. In keeping with the theme of the place the menu’s were done up like blackboards. The beauty of this was that while one page had the items that stayed from day to day ‘Classiques’, the back page then had their “Menu du Jour”, which as the name suggests, changes on a daily basis. Now given the blustery weather outside, three of our group, including myself couldn’t go past the French onion soup ($18) for our entrees. Bucking the trend was GG who decided that the scallop and lamb dish sounded too good to pass up. The arrival of our first course didn’t take too long, despite the restaurant being filled to capacity at this point. The French onion soup came served in an adorable white ceramic bowl topped with a generously large cheesey crouton. The crouton was so large in fact that I found myself using a knife and fork to get through it, which was a novel use of cutlery for a bowl I soup I thought… but it was worth tackling your way through the cheesey goodness because the soup underneath was very tasty. I would venture that it perhaps needed a little salt, but hey that why they put a salt shaker on the table so you can make that decision independently. I really enjoyed this entrée and while a decent serve it didn’t leave you wondering whether you’d be able to fit in mains. I was still feeling comfortable. GG raved about his entrée. He sampled my soup and in his opinion, he won the battle of the entrees with his selection. Too cute. For mains, there was a bit more of a spread of dishes around the table (though as it turned out my best friend and I had the same three courses – great minds I suppose 🙂 So GG couldn’t go past the Fillet Mignon – WA Beef tenderloin wrapped in streaky bacon, fondant potato, shiraz jus and bearnaise ($38), Mrs M and I went for the duck, Cuisse de Canard a l’orange et son tian de legumes – Twice cooked Duck Leg with vegetable tian, orange sauce ($34), and Mr M decided he would give the Casserole of the Day (which was lamb on this evening – $38)) a go. Again, timing wasn’t an issue, didn’t take too long for the meals to arrive. Everything looked and smelled amazing. It was a decent sized piece of duck that we were presented with, covered in a delicious orangey sauce and accompanied by a colourful stack of vegetables. The duck literally fell off the bone, it had been very well cooked, and the sweetness of the orange sauce married up well together. By the time I’d made it through the duck I was feeling more on the fuller side. Around the table, the casserole, which came presented in its only miniature casserole dish was said to have been very tasty…. And again GG claimed to have picked the best with this filet mignon. 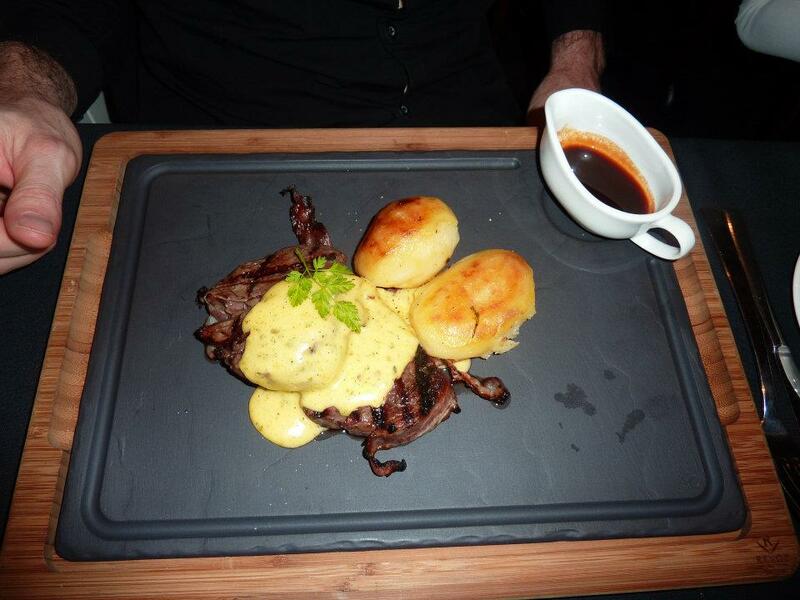 The steak was done to medium rare perfection, the roasted potato was the right balance crispy on the outside and soft and fluffy in the middle and the . No complaints from anyone on the mains, it was good fresh produce that had been very well prepared – tick, tick. And Mr M’s curiousity saw him order the Île Flottante ($12), which was a square of meringue on a vanilla custardy sauce. Said to be quite nice. And quite the generous cube of meringue! Chocolate mousse – rich at the best of times and quite a vision in presentation at this establishment. A top some slate sat a large wine glass full of mousse and what tasted like a little crème anglais and this above that spun sugar. The slate then had a few meringue stars nearby and a light dusting of icing sugar. Looked all a bit special. And the taste was equally as pleasing. While Mrs M had to tap on hers, I managed to just make it through. The boys also made it to the end of those, agreeing, as with other courses that they were very delicious. The meal ends with the waiters coming around and offering sweets from an old cigar box. It was all very quaint. Equally as adorable was that the bits of paper that our napkins had been secured with were actually little blackboards for us to write notes on with the white pens that they bought around. It made for quite a special end to the evening. The final cherry on top was that the chef wandered around the restaurant towards the end of our meal and said hello to everyone. Xavier told us about where he had worked before and how things were going at P’tite D’Ardoise. He was a lovely fellow and it was nice that he took the time to speak to diners. Always nice to say hello to the man who makes the amazing food happen. After my evening dining experience I could definitely see why folks were speaking so highly of this Beaufort St eatery. Definitely worth a visit if you after some fancy French fare.